If you want to see a beautiful vertical garden that is both decorative and economic, better visit the Golden Acres National High School in Brgy. Talon Uno in Las Piñas City. 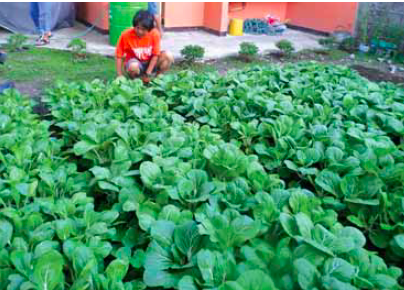 Kangkong growing in recycled bottles in the prize-winning Homeowners Association’s SARIAN garden. There, you will also meet the friendly school principal, Carlos Alexander Rigon, who is a passionate urban gardening advocate. 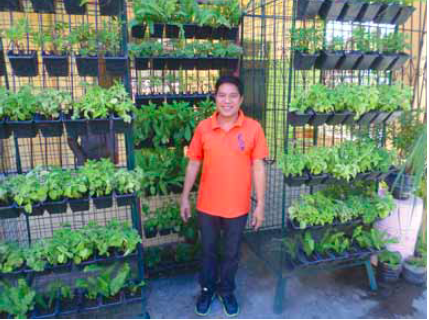 He is the principal architect of the garden that won the Php50,000 cash prize in the Inter-School category of the urban gardening competition launched by the Villar SIPAG (Social Institute for Poverty Alleviation and Governance) Foundation earlier this year. The awarding was held last May 15 during the city’s food festival. You will see how a limited space can produce enough vegetables for the home or even for the market. Rigon has come up with two types of vertical garden. One is the living wall on a simple vertical growing structure, in which eight layers of potted vegetables and herbs are installed, complete with drippers for convenience in watering and fertilizing. Beautiful pechay in front of a home in Las Piñas. The other type is what Rigon calls ‘tower gardening’. 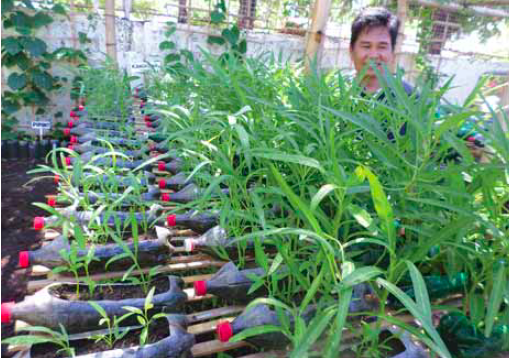 Here, plants are grown like small ‘towers’ that are supported by stakes of the appropriate size and height so that the plants will grow upward, just like a ‘tower’ of kangkong or a combination of kangkong and alugbati. The “tower” could also be a grow bag that is supplied by a plastics company based in Davao City. This is a white bag that is about six inches in diameter and about a meter tall. The grow bag is filled with the appropriate growing medium and made to stand with a stake for support. All around the sides, from bottom up to the top, holes are made where the seedlings of lettuce or some other leafy vegetable are planted. The Gulayan ni Pogi of Brgy. Talon Dos has beautifully growing vegetables. Watering is done by pouring the water at the top of the grow bag In another section of the school, Rigon also grows vine vegetables that include ampalaya, a giant patani, and patola. Actually, the urban gardening competitions conducted by the Villar SIPAG Foundation in 30 barangays in Las Piñas had three categories. The second category after Inter-School was Inter-Homeowners Associations and the third was Inter-Barangay. The winners were given their prizes on May 15. The winner in the Inter-Homeowners Association was the Luntian Kubo of Phase 3, West Talon Dos. 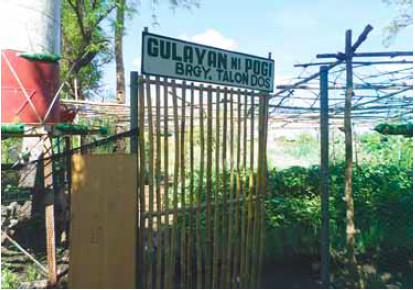 On the other hand, the winner in the Inter-Barangay was the garden of BF International/CAA, which features various vegetables and herbs plus a pond where ducks and fish are raised. The entry of Brgy. Talon Dos called “Gulayan Ni Pogi” is small but impressive for its very healthy and vigorous organically grown vegetables. These include plots of saluyot, kangkong, pechay, mustard, onion and a number of others. Carlos Alexander Rigon and his vertical wall garden. The city-wide urban gardening competition is a pet project of Sen. Cynthia Villar, who is a staunch advocate of urban agriculture. She is the chairperson of the Senate Committee on Agriculture and Food. As part of her advocacy, she gives free organic fertilizers to whoever would like to grow organic crops.